A man recovering from an attempted suicide is recruited to be the first human guinea pig in a time travel experiment. The organizers intend to send the man exactly one year into the past for one minute before returning him to the present. Previously the scientists have only performed the experiment on lab mice. When the experiment does not go according to plan the man begins reliving moments from his life in a series of random flashes. From this seemingly simple premise, director and writer Alain Resnais manages mine a wealth of emotion and thought provoking scenes as Claude Ridder is forced to relieve some of the most happy and most dismal moments of his life. The time machine itself is unlike any other found in movies or literature. Instead of being a mechanical device such as H.G. Wells' time machine, or appearing as something recognizable, such as Dr. Who's police call box, this time machine takes on an more organic appearance with very little working machinery visible. More akin to a womb than a mechanical device, the pod is connected to a series of monitoring devices that scientists use to record the traveller's journey. On one level the director is using time travel as a simple yet effective narrative device to tell a story in a series of flashbacks. Yet Resnais manages to transcend this simple plot device by also exploring the nature of time and memory in poignant manner. Even the inclusion of the lab mouse in the capsule with the traveller, while at times serving as a comic relief, becomes a critical clue near the end of the story. The mouse is able to return to the present inside the capsule while Ridder remains trapped in the past. 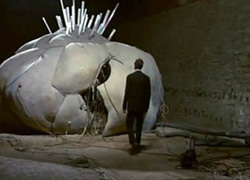 In a very subtle way, director Alain Resnais appears to suggest that where Claude Ridder has become trapped by his own memories, the mouse, devoid of such powerful memories, is free to travel in time. Revisiting the past, Ridder is haunted by regret, lost loves, guilt, and at times simple pleasures. In one scene where he is sitting at his desk at work he mutters aloud to himself how indistinguishable one minute is from the next in his life and that time seems to stretch out before him endlessly. As we slowly begin to piece together what lead Ridder to this point in his life, we discover that his attempted suicide may or may not be related to his time travel experiment. Did he shoot himself to ease the pain and misery of his life, or to escape the time loop he found himself stuck in. In this context time travel becomes a metaphor of reliving the past through memories - painful as well as the joyous ones. If we become stuck in our own time loop of visiting the past the memories can become too overwhelming. Suicide in context of the movie becomes a means to end or break the flow of time and memory. While the movie, may sound depressing given the areas I've chosen to highlight here, I should point out it is not with out a great deal of humour. On of my favourite lines from the movie is when asked prior to the experiment what his odds of success are, Ridder is told quiet honestly "If you are a mouse, 100%". Just a small footnote, Alain Resnais has collaborated with French director Chris Marker (La Jetee) on a number of projects and their shared interest in the nature of time and memory is very evident in much of their work. I'd also recommended Alain Resnais' Last Year a Marienbad for a very different take on the nature of time and memory. 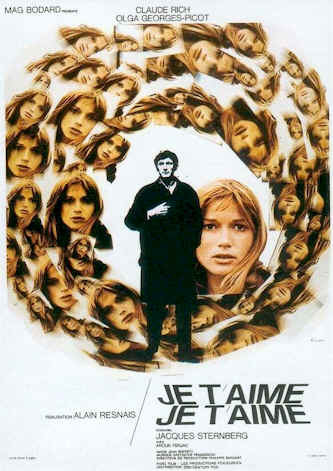 The ever useful Internet Movie Database entry for Je t'aime, je t'aime complete with cast info, plot summary, quotes, and other box office info. Andy's Anachronism's review of Alain Resnais' film "Smoking/No Smoking" based on the Alan Ayckbourn play Intimate Exchanges.